I found this recipe on Facebook when a friend posted a rave review of it. I thought it looked pretty good and I was excited to try it since it called for coconut oil and flax seed, both of which were new ingredients. Preheat oven to 350°F and set aside two cupcake/muffin pans with papers or reusable silicon holders inserted into place. Mix warm water with ground flaxseed in a small bowl and set aside for ten minutes, stirring together occasionally until it is a watery gel-like consistency. Add melted coconut oil, vanilla extract, and sugar to the flaxseed and water. Press most of the moisture out of the shredded zucchini and stir it into the wet mixture. In a large bowl mix/sift flour, salt, baking powder, baking soda, and cinnamon together. Combine wet mixture to this dry mixture and combine evenly, add in a little more water if you think the batter is too thick; fold in blueberries and pecans. Scoop batter into muffin cups with an ice cream scoop, fill them almost all the way full. Bake for 23-27 minutes, or until tooth pick comes out clean. For my muffins, we went ahead and made 24 cups. 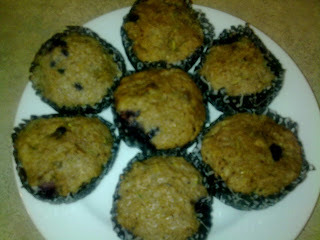 I put in double blueberries for sweetness so there was a bit more volume. But they don't puff up much at all so our muffins weren't very full. They tasted ok. My almost 3 year old LOVED them and ate one every day for about a week. My older kids balked. I won't make these again, but now I know I can grind up fresh flax seed in my coffee grinder. I think I might try ground flax seed in our next batch of smoothies.